Telerik UI for WinForms suite offers optimized themes which provide additional features such as custom fonts, built-in animations, gradients and shadows. The Visual Style Builder tool provides a functionality to blend the colors of an existing theme so that a completely new theme can be created for couple of minutes. The Crystal themes as well as the Fluent and Material themes are designed to work with predefined set of colors - primary and accent for the Material themes, and entire palettes for the Crystal and Fluent themes. The tutorial here will demonstrate how a new Crystal theme can be created. The same steps can be also followed with the CrystalDark theme. 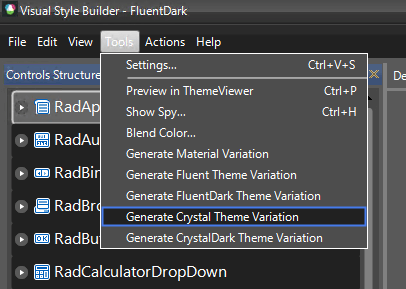 Visual Style Builder provides an easy way to generate different color variations of the Crystal and CrystalDark themes. Crystal theme blending uses the basic Crystal theme by executing a series of predefined commands. If you already have loaded a customized Crystal theme (but not a Crystal variation) it will remain loaded when generating a Crystal variation. 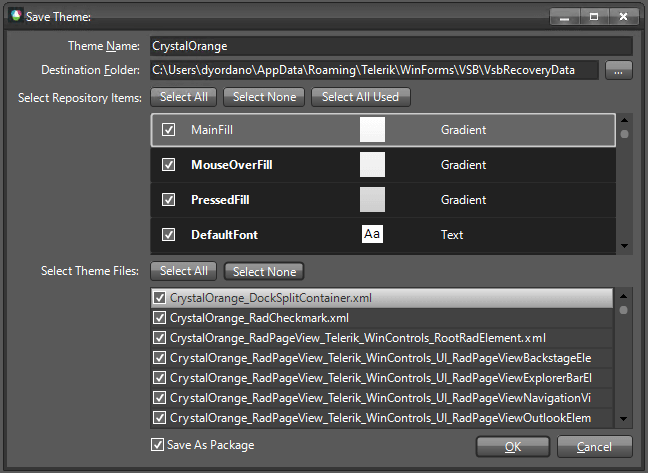 This will open the Crystal Blend Dialog from which you can create a new palette or modify the selected one. If you click the Generate theme button, a new variation of the Crystal theme will be exported using the selected colors.